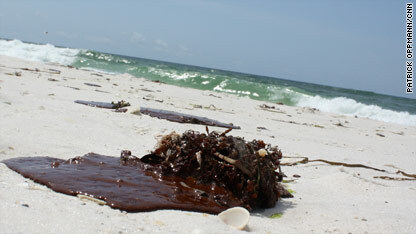 Tar sits on the beach in Gulf Breeze, Florida, on Friday. For days, CNN's small army of reporters, photographers and producers has been repositioning toward Florida as oil was expected to come ashore in the Sunshine State. And on Friday morning, tar balls - hundreds of small bits of hardened oil - littered Pensacola's white beaches. Our iReporters had been saying they had spotted tar balls nearby and in different areas a few days earlier. So we set out to check the beaches. Further south on the beach on Friday, we saw blobs the size of a Frisbee of reddish-brown oil. Nobody knew for sure whether the tar was from the Deepwater Horizon disaster. Local officials said that so much tar had been piling up that they didn't have the resources to test all the balls and blobs of oil locally, so they would be assuming that if they came in such large amounts now, they were probably from the disaster in the Gulf. Similar tar balls and oil slicks have shown up on beaches along the Gulf since the rig exploded and sank. Friday afternoon, reporters and residents got the answer they were waiting for: Florida's Division of Emergency Management issued a statement saying, "tar patties and tar balls have been confirmed in widely scattered areas east of Pensacola." Reconnaissance flights are taking place to determine all of the locations nearby that may be affected. While that goes on, some tourists will keep on cleaning - and worrying. Tourist Catherine Maloney looked at the blobs of oil with surprise and disgust before taking pictures of them. "This is going to affect this area for years," she said. "It's already so quiet, it feels like a hurricane came." Is there work for $ to clean up? Unfortunately I believe the only way we are getting this well to stop leaking is to "drill baby drill"
The relief well being drilled should somehow be sped up if it is not already working at full capacity. Instead of bashing everything everyone else is doing wrong, why can't this be a place to give people information on how THEY CAN help? There are plenty of people (including myself) who have trips scheduled to gulf beaches and instead of cancelling these trips, impacting tourism and getting nothing done, they'd likely be glad to have information on how they can get involved in helping clean up. This is a horrible and unfortunate dissaster but sitting here criticizing everyone else while you're doing nothing isn't going to help with the mess. CC: BP., CNN, FOX NEWS, NOAA, Governors of: AL., FL., LA., MS., And TX. ATTENTION!! The PRO-ACTIVE OIL SPILL CONTINGENCY PLAN listed above will not plug oil leaks but, it will address five major problems; two of witch, are concerns that have not been addressed in the media or in the government. 1. It truly is a LONG TERM-CONTINGENCY PLAN. It will help the community rebuild revenues while providing a fast action operational plan for future oil spills. Yes! Future oil spills will surely occur, despite future prevention efforts! 2. This plan is full circle and would included staging, seeding, re-claiming and re-processing all of the contaminated oil’s, oil filled sands and seed materials back into re-usable fuels and commodities. 3. It creates no added impact on marine life or the environment. It also poses no threat to humans and/or other forms of wildlife. Oil, feed stock and sand processing are near emissions free processes. 4. It will generate $30,000,000.00 worth of new revenues for the communities that embrace staging and plant processing operations. The plant would remain in full operation after the clean-up is done. 5. It will also add about forty new jobs to the community. This is not only a plan to help with short term clean up’s, it will also have a positive long term and lasting effect on the community as well. We all know that BP has been feeding us misinformation and then trying to mobilize volunteers to help minimize their cost. Yes! We sent BP and other agencies this plan. Operations of this nature have a price tag associated with them and so, it would appear that they have no wish to spend anything on spills they can’t control or that won’t go back into their pockets. The OMRS-100 technology is patented and, M.O.S.E.S. (The oil absorbent) can be tested in less than fifteen minutes! As always our government is seeking a short term quickie (political talk) so we can get a long term scr**ing! Has anyone mentioned where they (BP) plan to put and/or dispose of all of that contaminated; oil, sand and material? We are pretty sure that without intervention it will be in somebody’s back yard, neatly hidden from sight, killing something else. Don’t you think that any oil spill plan should at least consider: Prevention, Mobilization, Extraction and Disposal Operations? Thank you for your time. We would love to receive some constructive input from anyone who is as concerned as we are. How to help? You can vote Consumer or Independent Party.